Showing 41 - 45 of 45 results. 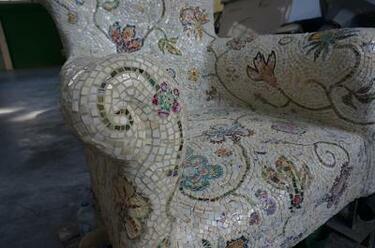 A photograph of Crack'd for Christchurch's almost-finished armchair mosaic. Crack'd for Christchurch comments, "The arm in the foreground is grouted. The rest is not." A photograph of a workstation in Crack'd for Christchurch's workshop. 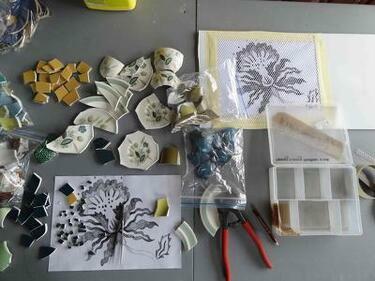 The workstation includes pieces of broken china, a pair of cutters for breaking up china, a plastic container to hold china pieces, and two mosaic plans. One of the plans has a piece of mesh laid over the top. 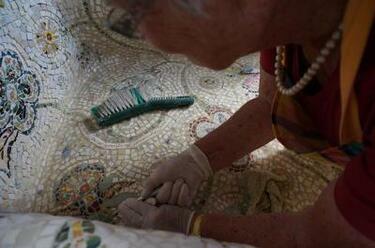 The other is being used to lay out the mosaic. 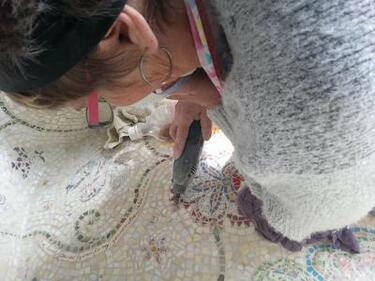 A photograph of Helen Campbell using a tool to remove excess grout from Crack'd for Christchurch's armchair mosaic. 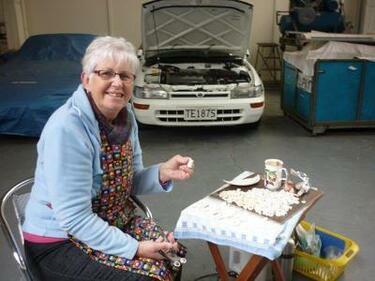 A photograph of Katherine Innes breaking up pieces of china in the garage where Crack'd for Christchurch are working on their armchair artwork.